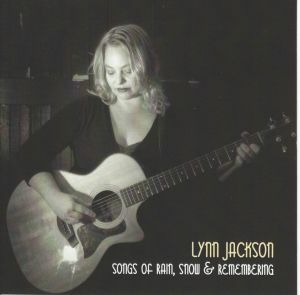 A little over six months ago, I reviewed Lynn Jackson's last album, The Acoustic Sessions, an intimate and faithful duo set with Chris Boyne. Songs Of Rain, Snow And Remembering is ostensibly a solo record, and as such retains the close intimacy of its predecessor, while giving an additional impression of delicate lushness that emanates largely from the creative deployment of her backing musicians Arun Paul (piano, percussion), Nick Storring (cello), Joe Dunn (guitar), Brent Hagerman (electric guitar), Chris Boyne (harmonium, also duet vocal on Riding Out The Storm) and Scott Fitzpatrick (bass), with whom Lynn evidently has a close artistic rapport. As indeed she has with the album's producer, Norman Blake (of Teenage Fanclub). One might find it hard to understand why Lynn's not better known, for the quality of her singing voice is evident from the first note - its melodic expressiveness, its assured line and her total identity with her songs. This is as it should be, for the album consists almost entirely of Lynn's own material: confessional songs of an understated power that don't exclude the listener from her thought-processes and yet don't insist that the listener takes every step of the journey. Her stories and feelings are unfolded at a leisurely pace, allowing the images and phrases to determine both the musical flow and direction, and the often interesting texturings which the aforementioned musical collaborators can bring to the table. The use of piano and cello in particular is something of a departure for Lynn, and those timbres suit her songs well, while the unwavering, bold and confident electric guitar embellishments on a small handful of songs are both accommodating and stirring. The one exception to the self-penned menu is a solid cover of Townes Van Zandt's Rake, which fits comfortably within the context of her own songs. It's a very consistent set, even-toned almost to a fault in fact, for there's surprisingly little variation in tempo or mood: everything is at a uniform slow-medium pace. Haunting though this can be for the space of a few songs, it's more difficult to maintain attention over the total span of the disc, and only the occasional incorporation of some more animated percussion or cello rhythms (on tracks like Mine Alone and Winter Sun) are found to provide the necessary relief and momentum. So maybe I've answered my own question.